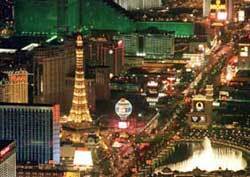 The Las Vegas Strip in America becomes one of the most dazzling scenes on earth after the sun sets. Lights blaze. Energy quickens. Big rollers gamble. Top entertainers perform. All these take place along a 5 kilometer (3 mile) desert road lined with flashy hotel-casinos. Casino lighting is designed to appeal to the subconscious. Las Vegas casinos install millions of bright, flashy, colorful lights outside to lure you inside and innumerable dimmer, more subtle lights inside to put you in a gambling mood. Another ploy is positioning elevators, reception desk and restaurants far away from a Las Vegas hotel-casino's main entrance. This forces people to walk by tempting slot machines and other gaming devices on their way to and from those destinations. Casinos know that people gamble bigger sums and more eagerly at night. That's why Las Vegas casinos are windowless. It creates the illusion that its nighttime even though its midday and the sun is shining brightly outside.